BullionVault is one of the top two precious metals dealers online offering the opportunity to invest in gold and silver bullion and store your metal offshore. BullionVault offers storage in New York, London, Zurich, Toronto and the wildly popular Singapore. These online Gold accounts are the often deemed the best way to buy Gold; in that they are the most convenient and least expensive way to get started in Gold investing, and other precious metals. BullionVault is owned by Galmarley Limited and registered in Great Britain. While British subjects may have additional reporting issues of their BullionVault activity, BullionVault does NOT report your trading activity and gold ownership to any authorities, nor send out 1099’s to U.S. taxpayers. That said, they WILL cooperate with authorities if necessary in the investigation of criminal activity and money laundering. BullionVault is for legally acquired funds only. BullionVault is typically compared to and is a competitor of GoldMoney, although there are important differences. It is not simply a GoldMoney alternative, but actually has unique merits. One unique factor about BullionVault is their offer to give you 4 free grams of Silver that you can actually begin trading right away. They also give you US$1 or 1 Euro or 1 Pound Sterling. 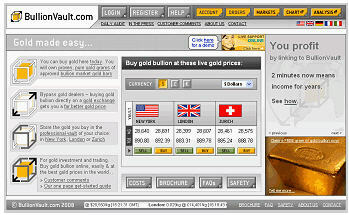 This allows you to try out their system of buying and selling gold, even in different currencies. These offers do vary from time to time so it may be different the particular time that you check. How Do I Get Started At BullionVault? BullionVault is the easier of the two top online gold purchase and offshore storage vendors to get started at in our opinion. Verify your identity, which is easily done online. Place a bid for gold or silver. To get started with a free BullionVault account, simply pick a username (6-12 characters, letters and numbers only), supply a good email address and choose a very strong password (6-20 characters, letters, numbers and special characters allowed). We recommend using all 20 characters with at least 1 uppercase letter, 1 lowercase letter, 1 number and 1 special character. Use of a free encrypted password safe is recommended for storing your password. The also ask “how did you first find BullionVault” but there is no need to answer that. You will shortly receive an email from them with the subject “You have free bullion”. Included are links to login to your account and continue getting started. BullionVault is intent on complying with the “know your customer” guidelines that any financial institution dealing with American citizens must adhere to, but seem to do so in a less obnoxious fashion. All the documents required can simply be scanned to a pdf and uploaded right on their website. If anything is missing or needs clarification you will receive an email detailing what you need to do. Chances are that the entire process can be completed, and you receive an email telling you so, within about 24 hours of registering your new account. If you have a living trust, only a simple certification of trust needs to be provided. Corporations, including LLC’s can also register a BullionVault account. You can begin trading your free gram of gold almost immediately but you do need to fund your account to retain the gold permanently. A funding instructions document with clear details of your options will be emailed to you. On our most recent account opening, ACH was an option and it previously was not; though for some reason mailing a check was NOT an option for that account. Wire transfer. In order to keep wire costs low for U.S. customers, a New York bank can be used to avoid an international wire fee. This is the quickest way to fund your BullionVault account. Send a check. Here again, an address in Dallas, Texas is provided so all you need is a stamp and a couple of days in the mail. Online. If you have the ability to pay someone online through your bank, that will work also and usually require 3 – 5 days to clear. ACH may be an option. When you are ready to actually buy gold or silver in your new BullionVault account, the order wizard makes it easy. First, choose the bullion you wish to buy. The options are gold and silver but with gold you also choose which vault you wish to have the gold stored in. If you want your gold offshore then be sure NOT to choose your country of residence. For silver, the only choice used to be the London vault, but now Zurich and Singapore are options for silver as well. Current choices for gold are New York, London, Zurich and Singapore. Most people seem to find Zurich the most appropriate in the past but Singapore is very popular now that it is open. The vaults themselves are owned and operated by ViaMAT, but others like Brinks are coming online in newer locales. Here is where you can see how BullionVault differs from their competition. 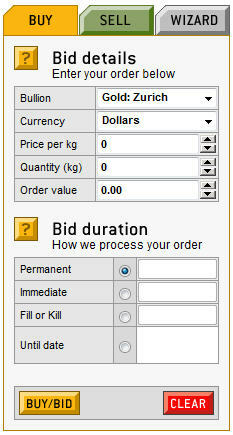 You can specify how much you are willing to bid for the bullion, and the duration of the order. Most people will probably choose permanent but you can specify an ending date. Fill or Kill means that if the order cannot be executed right away it will be canceled – or “killed”. What Vault Options Do I Have With BullionVault? The New York and Toronto locations are new as of August 2013. New York offers Gold storage only. That may very well change (Toronto just added Silver in September 2013), but is a non-issue for so many of our readers who prefer “friendlier” jurisdictions such as Zurich and Singapore. In fact, Singapore has gotten VERY popular, VERY fast. Shows what can happen when a government “gets a clue” and legislates accordingly. (A VAT tax was eliminiated in late 2012). For North American investors who prefer their bullion close to home, New York and Toronto are welcome additions, especially since you can actually buy Gold cheapest in New York – by a buck or two per ounce. Zurich is tried and true, but was filling up as of 2012 making VIAMAT, the vault operator, scramble to expand. We are comfortable with the safety and security of all the vault locations, but for jurisdictional reasons personally prefer Zurich and Singapore currently. How Safe Is My Gold and Silver at BullionVault? BullionVault goes to great lengths to assure your gold and silver are safe. All bullion stored in its vaults are warranted and guaranteed to be 100% pure gold or silver. They can do this since each bar they own has a recorded history and an absolute guarantee of its quality and content through a “chain of integrity”. The vaults are operated by VIAMAT (now operating under banner of Loomis International), one of the world’s strongest and most trusted specialists in bullion vaults. In the vault your gold (or silver) is soundly protected. It exists under the jurisdiction you choose, so you yourself select the government and legislative structure you trust to protect your property. You can switch jurisdictions in moments. Access to your account is protected with state of the art encryption technologies – but BullionVault is designed to allow account access to be compromised and still keep your property safe. Withdrawal restrictions ensure value on your account is returned only to you. You can at any time monitor BullionVault records to prove they correctly assign vaulted gold to you. Your account is logged in to (optional). An order is placed (optional). A withdrawal request is entered. A withdrawal request is processed. You can set up your mobile/cell phone number and enable/disable the optional messages from the account settings page. BullionVault prepares electronic copies of our current bar lists and bank statements as soon as we receive them, and we publish them on the web. The link to them is on the page of our reconciliation of all BullionVault customer property – known as the Daily Audit. BullionVault LOWERED commissions in late 2012! Note: BullionVault keeps lowering costs so you may login and find rates even lower than this! Gold storage is charged at the rate of 0.01% per month (0.12% annually) and is subject to a $4 per month minimum. Silver storage is charged at the rate of 0.04% per month (0.48% annually) and is subject to $8 per month minimum. Silver storage costs are naturally higher most anywhere since silver physical volume is much higher per dollar of value. BullionVault is a great company to buy gold and store gold offshore. 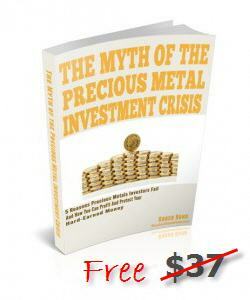 It is physical gold (or silver), it is allocated to you, and it is audited daily. They are compliant yet not overly intrusive. The bottom line is that we very much like BullionVault for storing offshore gold and feel very safe working with them; Yes, we have accounts with them. We are actual customers. >>Click Here: Open a BullionVault account right now<<.